Book Title: "Tell Me A Story"
I am so thrilled to be reviewing this book. I am looking forward to using this book for many years to come. I am sure you are wondering why I am so excited about this simple book. So let me get right down to it. 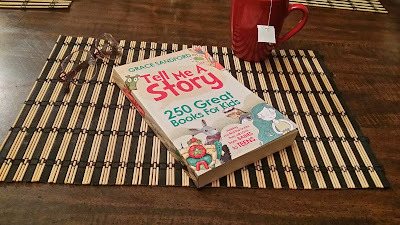 "Tell Me A Story" is a book guide that will save me many hours picking and choosing books for my grandchildren. I have written time and time about the books I have gotten for my grandchildren. I always express the importance for developing a love of reading in children. Well, the author Grace Sandford has the same belief as I do when it comes to children and reading. What Grace Sanford has done is researched lots of children and teen books. She has collected all this great information and put it together in this handy book. The book is divided into five sections. Babies to age 2, 3 to 5-year-olds, 6 to 8-year-olds, 9 to 11-year-olds and 12 into teens. In each section are 50 titles listed. These book are then listed into categories and then alphabetically. I can't even begin to count the hours I have spent online and in book stores searching for the perfect book for each of my grandchildren. I believe a child has to love being read to if they are going to learn to enjoy reading. If a book fits the child's interest half the battle is won. That is what "Tell Me A Story" is all about. Finding the right book for the right child. When my oldest son was growing he would sit with me for hours and let me read him stories over and over. As he grew older his love for reading turned into a battle. He wanted to read but I struggled to find books that could hook his interest and keep it long enough to improve his reading skills. Then I came across some Goosebumps books. They were just a bit above his reading level but I figured they might be just what he needed. I was right he was addicted and we spent a small fortune on his collection. It was money well spent as he became an advanced reader in a few weeks. Knowing how important good reading skills are to finishing school, getting a great job and living a good life. I am all for using every trick up my sleeve in helping encourage my grandchildren to love reading. So stop over to Amazon and pick up "Tell Me A Story". Make your children's book selection in the comfort of your home. You will have more time to read to your child and spend less time shopping for all those great book. Sounds like it has a great selection. Good reading skills are very important to get through life. What a great guide this is for you.